Mumbai-based Ketto Online Ventures Pvt Ltd, which operates an online crowdfunding platform, has raised Rs 4.4 crore ($700,000) in a fresh angel investment round led by one of its existing investors Pradyumna Dalmia, co-founder of Calcutta Angels and Sudhir Rao, deal champion of The Chennai Angels & co-founder of IndusAge Partners, as per a press statement. The other investors who participated in this round are Singapore Angel Network, Indian Internet Fund, LetsVenture, Intellecap Angel Network and ah Ventures. The startup will use the money to double its technology and business development team as part of its aim to facilitate $100 million in funding for other firms, the statement said. It will also use part of the funds to expand operations in Singapore, Indonesia, Malaysia and other Southeast Asian countries. 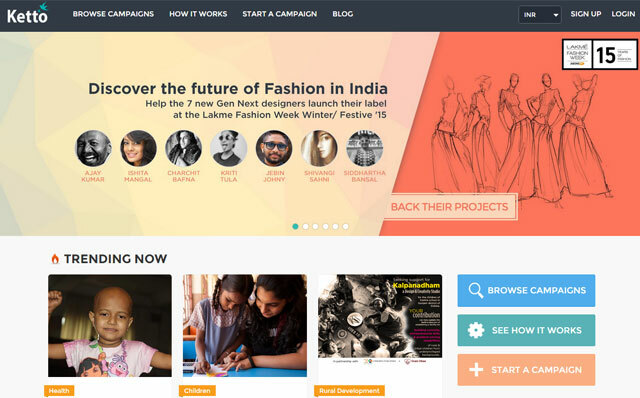 A crowdfunding platform for creative and social causes, Ketto connects individuals and brands with investors. Its site also helps non-profit organisations to raise funds by connecting them to companies and individuals. The startup was founded in October 2012 by the trio of Varun Sheth, Kunal Kapoor and Zaheer Adenwala. While Sheth is an alumnus of Narsee Monjee college, Kapoor is a Bollywood actor. Adenwala holds a BS degree in Mechanical Engineering from Drexel University, Philadelphia (the US), and earlier worked at Directi. The company had previously raised angel investment of Rs 77 lakh from Club ah!, a network of investors and part of ah! Ventures, and Calcutta Angels in 2013. In the last 12 months, multiple celebrities and corporates have backed various projects by raising funds on Ketto. The list includes Hritik Roshan, Amitabh Bachchan, Anuskha Sharma, Myntra and Star Sports. Recently, Ketto partnered with Lakme Fashion Week to provide a platform to over half a dozen designers to garner funds to launch their label at the upcoming showcase in August in Mumbai.